decided to leave and pursue other activities outside the Army. Brian spent many years playing around with old army parachutes, being towed behind boats with not much success and many mishaps. Brian who was always a showman at heart decided around 1979 to set up a display team called Landbeach Parakites Display Team, and offered shows and demonstrations around the World. After many years of flying parasails, with shows on the River Thames and many other events, Brian decided to use his creative ideas and expertise to manufacture his own parasails. From 1985 to the present time Sportlite has improved the first basic design of parasails to the sizes and style now accepted as the worlds best. We are the leading Parasail Manufacturer worldwide utilising the latest technology and years of skill to continue our development of parasailing technology, ensuring we make the safest possible products for you. In 1981 Brian Tripp was approached as to whether he would be able to organise a charity event with a view to raising funds for the International Year of the Disabled. 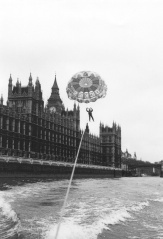 Brian came up with the idea of flying a parasail beneath a bridge on the River Thames, and so in December 1981, with the help of Chris Abbot and Dave Holliday, Brian became the first person to fly a parasail beneath Lambeth and Westminster Bridges. 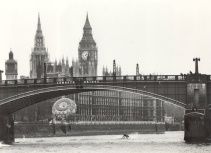 In 1983 Brian was, again, approached by two Cambridgeshire police officers, Gil Boyd and Bob Reynolds, for his advice and assistance on a charity event, which would involve them being towed along the River Thames on a parasail and flying under the 10 London bridges from Lambeth to Tower Bridge. Brian was approached by Gil and Bob because of his involvement with the Landbeach Parakites Display Team and because the Thames was no newcomer to himself as he had already flown under two of the bridges and organised three Thamesday events, which involved various demonstrations by the team on the river. Brian gladly agreed and so the plan to fly from the foreshore just before Lambeth Bridge to the finish line just past Tower Bridge was put into action. So on July 11th 1983 the two daring policemen with Brian and Chris Abbott,driving the boats, entered the Guinness Book of Records for parasailing under the ten London Bridges in a time of 26 minutes, raising nearly £3,000 for the Great Ormond Street Hospital. In 1986 Brian was once again approached, this time it was from the producers of BBC's Record Breakers. for Roy Castle to attempt it. 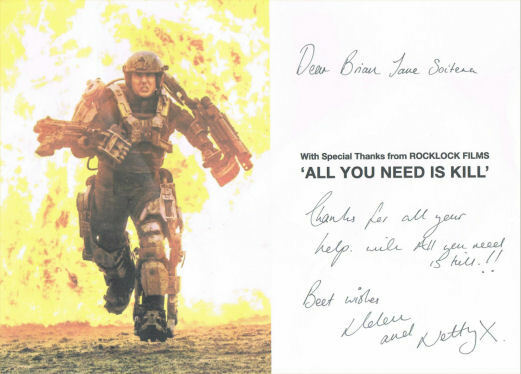 Brian readily agreed and once again the wheels were set in motion. All of the above attempts were performed with the full co-operation of all the relevant agencies. The above record attempts and stunts should not be carried out without the proper authorisation, equipment or knowledge of the sport.